Heat oven to 425°F. Unroll 1 pie crust in ungreased 9-inch pie plate. Press firmly against side and bottom. In large bowl, mix apples, dried fruit and walnuts. In small bowl, mix brown sugar, flour and pumpkin pie spice. 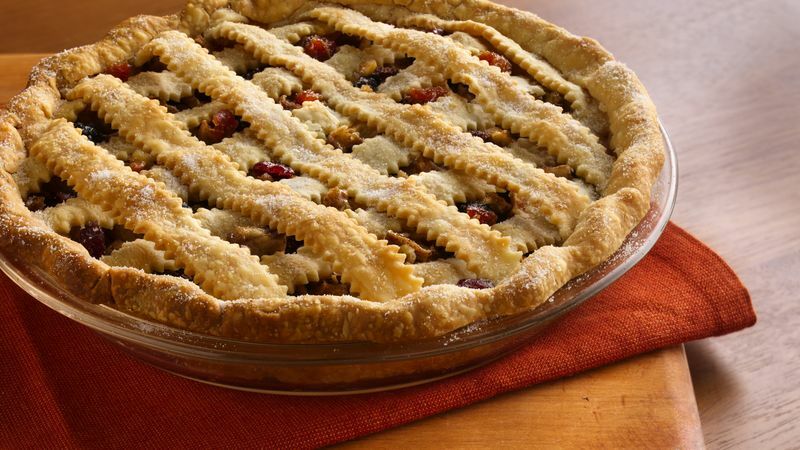 Gently toss with fruit mixture; spoon into crust-lined pie plate. To make lattice top, cut second crust into 1/2-inch-wide strips with pastry cutter. Place half of the strips across filling in pie plate. Place remaining strips crosswise across first strips. Trim ends of strips even with edge of bottom crust. Fold trimmed edge of bottom crust over ends of strips, forming a high stand-up rim. Seal and flute. Bake 30 minutes; sprinkle top with granulated sugar. If necessary, cover edge of crust with 2- to 3-inch-wide strips of foil to prevent excessive browning. Bake 10 to 15 minutes longer or until apples are tender and crust is golden brown. Cool at least 2 hours before serving. Cover and refrigerate any remaining pie. For party-perfect presentation, drizzle warm caramel sauce on serving plates in a zigzag pattern. Place pie slice on top of caramel. This was a winning pie from the national Pillsbury® Refrigerated Pie Crust Championship in 2007. The recipe was submitted by Mary Campbell Crutchfield of Collierville, first place winner of the Mid-South Fair (TN).